Monday saw La Siesta Sputniks orbiting around the Country Bowls rinks. Three of the Sputniks got ‘lost in space’ but two of them managed to hang around giving a result of Flamingos 8 Sputniks 4. Country Bowls welcomed La Siesta Silvers on a beautiful dry Friday morning. Both teams were poised to take the points and as the wind picked up, the individual matches were thrown into turmoil. Rinks 5 & 6 both playing two styles of game and strategy and adjustments were the order of the day. In the end it was 3 – 2 to the Silvers with the Cubs taking the shots by 1. 76 – 75. Overall a great days bowling and a very fair 6 – 6 result. Chris Stevens, Craig Dyson & Andy Bryce. The second game of the day saw the Geckos away in the afternoon to San Luis Leopards with no less wind than the morning match. Shots 97 – 83. Points 7 – 5. 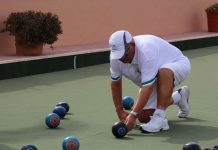 For more information on Country Bowls please visit the website www.countrybowlsmurcia.com, email grahamandjo7@gmail.com, or telephone 966191552. Monday found the Palominos having a bye. The Pintos played the Hawks at Horadada, with a stiff cold breeze bringing out the thermals and many layers, of course by the end of the match we had warmed up. The Pintos took a while to get used to the mat and in the end came away with two rinks, never a bad score away from home.In the afternoon the Raiders were at San Miguel playing their Pointers, which turned out to be a tough match, as we would expect as San Miguel always turn out a good team particularly with the home advantage, it’s a hard call. The Raiders came away without a point but were not shamed. 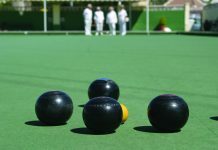 Friday morning found the Mustangs entertaining Emerald Isle Cavaliers on a wonderful morning with a stiff breeze, which made the bowling very tricky. Most of the way through the match the Mustangs were behind on all rinks, but came good to take 4 of the rinks and the overall shots by just the one shot. The Broncos were at Horadada playing the Royals and put in a good performance to take 3 rinks, a very good away result. The Rangers played the Conquistadors at Vistabella and were a trip short and no doubt the wind caused a few problems. They came away with one rink, but enjoyed the challenge. In the Voyager Division the Chestnuts were at home to San Luis Vulcans, final score was 81 – 77. points 10 – 2. Best winning rink – Doreen Watt, Carol Stobbart, skip Graham Watt. – 23 – 11. And in the Discovery Division it was another good win for the Sycamores, final score – 108 – 57. 10 – 2. Best winning rink – Jim Mclean, Les Barber, skip Barry Collins. 31 – 13. The Maples completed the hat trick of good wins for Greenlands beating Vistabella Eagles by the same margin. Final score were 107 – 60. 10 – 2. Best winning rink – Margaret Stephens, Margaret Dewar, skip Richard Lee. – 28 – 5. This win keeps the team at the top of the League, so well done everyone. 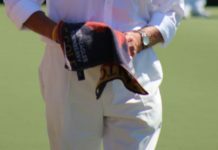 In the Fed 4s the Beech were away to Country Bowls, final score….67 – 31. 8 – 0. Best winning rink – J Thompson, J Giddings, C Harris, skip D Giddings. 30 – 7.In Division A the Oaks were at home to Vistabella Picadors, final score – 101 – 72. 8 – 4. Best winning rink S Simmons, J Hier, L Rudge. 28 – 7. In Division C The Elms were away to Emerald Isle Roundheads. Final score – 95 – 86. 8 – 4.best winning rink D Field, J Bliss, skip D Thompson. 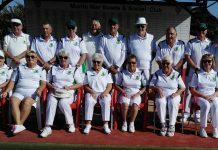 30 – 6. for all inquiries please contact Chris Dewar on 698418987 or visit our website greenlands-bowls.wixsite.com/greenlandsbowlsclub thanks. The shots for was 97 and the shots against was 73, giving us the overall shots. The final result was 8 points to Horadada and 4 points to El Rancho. Very well played to all of the team. A great result. Keep ‘em bowls a rollin’ Horadada, we have plenty matches left to play to move up those tables. In the Enterprise Division The Apollos visited Montemar to play the Matadors and managed a good win by 88 shots to 78 winning on 3 rinks. Best winners for the Apollos were Mike & Florence Edwards with Dave Davies 21-10.Wins also came from Trish & Pat Reilly with George Richardson 20-18 and Pat Harman, John Taylor and Jean Cooper 17-15. So an 8 points to 4 victory. In the Voyager Division the Pioneers entertained Emerald Isle Saturns and also won by 94 shots to 85. The best winning rink came from Pat Moore with Bill & Sue Jordan 23-13 closely followed by Tony & Val Dalton with Vic Mahomet winning 22-15.the other winners were Gordon Dall, Tony Campbell and Dave Laverick 16-14. So an 8 points to 4 victory. The Sputnicks away at Country Bowls managed wins on 2 rinks losing the overall shots by 93-66. 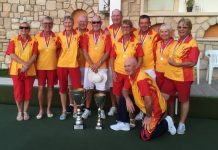 The winners for La Siesta were Kathrine Morrisroe, Ken Stringfellow and John Clarke 23-9 and Dot Kocsis, Tom Heaslewood and Noel Morrisroe 16-13. So 4 points to the Sputnicks and 8 to Country Bowls. 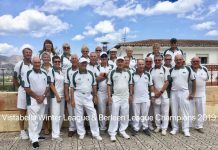 In the Winter League La Siesta entertained El Cid in an exciting match with La Siesta taking the overall shots by just 2, 87 played 85.La Siesta had wins from the rink of Doug and Fay Beattie with Tony Campbell and Jean Cooper 25-12 and from Irene Laverick, Tony Dalton. Pat Harman and Jenny Bowman winning 20-11.With El Cid winning the remaining 3 rinks the points were Shared 6 apiece. In the Fed4’s the Hoopoes were at home to San Luis Bazars and won by 60 shots to 48 winning on 2 rinks and picking up 6 points. Winning rinks came from Sheila Millward, Pat Moore, Val Dalton and Sue Jordan 29-12 and Jim Eastwood, Bill Jordan with Dave and Irene Laverick 21-11. 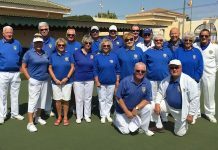 In the Southern League A Division the Blues at home to Vistabella Lanzadores managed to win on the rink of Ann and Robert Heath with John Ball 19-17. The overall shots went to Vistabella by 110 shots to 74 so just the two match points to the Blues. By 76 shots to 68 but won on 3 rinks thereby sharing the points 6 apiece. Wins for the Golds came from Pat Moore with Bill and Sue Jordan 19-12, Irene and Dave Laverick with Ros Stockell 13-10 and Derek Smith with Gordon Dall and Alan Mawer 17-14. By 75 shots to 76 but won on 3 rinks thereby sharing the points 6 apiece. 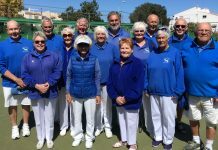 Wins for the Silvers came from John & Hilary Clarke with Ken Stringfellow 19-8, Kathleene and Noel Morriscoe with Willie Mcvey 19-9 and Janette and Lee Plummer with Wendy Ralph 20-12. A very good mornings bowling at home against San Luis Leopards. The Matadors won on all rinks, well done everyone. Winning on two rinks the Matadors were at home to the Apollos. Well done to Tanya Oliver, Bill Judd skip Jack Burrell, Lynne Armitage, Ronnie Cairns skip Dave Melville. Monte Mar visited San Miguel in the winter league and had a enjoyable day winning on two rinks and close on another. Well done to Lynne Armitage, June Young, Phil Goble skip Dave Melville, Gina Hindle, Tanya Oliver, Ronnie Cairns skip Jack Burrell. In the South Alicante Winter League all 3 Quesada squads played San Miguel teams this week. Quesada Pearls travelled to San Miguel to play the Beagles for a morning of very competitive bowling. Due to illness, the Pearls were unable to field a full squad but they won on 3 of the 4 rinks played and achieved 68 to 66 shots before penalties of 2 points deducted. They’ve maintained their 4th place in the league, just one point behind 3rd place San Miguel Beagles. 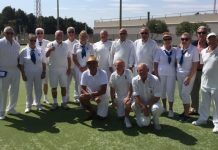 Meanwhile on a lovely sunny morning perfect for bowling, the Diamonds entertained San Miguel Alsatians, currently a couple of places below them in the League, so a result was a priority for both teams. Quesada won 3-2 rinks but the shots went to San Miguel by the narrowest of margins 91-90. The points were drawn 6 each so the Diamonds maintained their position in the league. The Rubies also hosted San Miguel – the Dalmatians. Not the best of days for the Rubies who lost the match 2 -10 and the shots were 65 to San Miguels 112. Onwards and upwards Rubies, plenty more matches to play! In the Southern League, Quesada Swifts travelled to Mazarron for a sunny and warm days bowling. Another important league match between Mazarron the leaders and the Swifts in second place, so everything to play for. After a tough morning, Mazarron were victorious winning 4-1 rinks and 97 to 54 shots, winning the match 10 points to 2 and maintaining their lead at the top of the league. In the Winter league, Quesada hosted Javea and the match ended in a draw 6 points each. In the Federated 4’s, Quesada Panthers played San Miguel Mohawks. Quesada won the rinks 2-1 but lost the shots by one, 48-49, so the match ended in a draw 6 points each. A mixed week with unexpected rain and wind making playing NOT a good experience, and some unexpected results. Some of our teams bounced back well this week, some were rather deflated. SA League Monday 21st Klingons away v VB Albatrosses a good result; 83shots-76, 8pts-4. Winners: Pam Lockett, June & Keith Jones, 18-13, William Holtham, Sabrina & Russell Marks 25-13, Ann Holland, Ray Pollock, Ian Kenyon 20-16. 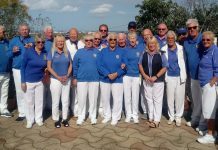 Trekkers home v VB Drivers, an excellent result 12-0, 106 shots-68.Winners: Shirley Verity, Jo & Jules Pering 17-14, Allen Bowen, Suzi Cooper, Scott Malden 28-11, Mags Haines, Peter Fuller, Les Bedford 22-12, Margaret Roseveare, Marina Beardsall, Graham Bird 20-16, Ros Holmes, Jan & Brian Pocock 19-15. Romulans a tough match against a very strong VB Boogies team; 0-12, 45shots-129. Vulcans away v GL Chestnuts 2-10, but very close shots 77-81; unfortunately just one super winning team: Dennis Jackson, Margaret Clarke, Brenda Brown 32-9. Wednesday 23rd Winter League: a cold, windy day away v Vistabella, and a hard fought match for 3points-9, 72 shots-95. Winners: Pam Lockett, June Jones, Peter McEneany, Keith Jones 15-15, Kath Reid, Giuseppe Galelli, Neil Morrison, Ian Kenyon 19-14. FED 4’s League: Thursday 24th Ospreys BYE. Condors had a good result home v SM Cherokees, 53 shots-48, 6pts-2. Winners: Mags Haines, Ray Watmough, Les Bedford, Brian Pocock 24-10, Ros Holmes, Judy Carroll, Barry Edwards, Neil Morrison 19-15. Bazas away v LS Hoopoes, a better result, 48shots-60, 2pts-6. Winners: Mary & Tom Fromson, Ralph Jones, Lyndon Johnson 25-11. Southern League: Friday 25th Lions away v EI Claymores, another excellent result; 12pts-0, 114 shots-62 Winners: Colin Jackson, June & Keith Jones 23-12, Kath Reid, Pam Lockett, Ian Kenyon 21-13, Margaret Morrison, Keith Phillips, Neil Morrison 26-12, Janet McEneany, Ray Pollock, Peter McEneany 27-9, William Holtham, Ray Clarke, Giuseppe Galelli 17-16. Tigers, away v Q Swallows, the usual hard battle, 74shots-95, 3pts-9. Winners: Margaret Roseveare, Peter Fuller, Les Bedford 18-18, Shirley Verity, Jo & Jules Pering 17-15. Leopards home v CB Geckos, some useful points: 5pts-7, 83shots-97. Winners: Audrey Ford, Cas Blay, Phil Hasler 22-15, Steve Rossiter, Dave Tilley, Malcolm Ayton 16-16, Kath Waywell, Charlie Marigold, Brenda Brown 22-18. Pumas, home v LM Merlins, hard work against a strong team: 0-12, 55shots-117. San Miguel Pointers were home to El Rancho Raiders on Monday and had another great win gaining all 12 points (126 shots to 46). The trio of Peter Masters, Ann Allen and Dave Greenland had a brilliant win with 36 – 3. San Miguel Dalmations were away to Quesada Rubies, winning 10 – 2 (112 shots to 65). The best trio were Stan North, Bob Graham and Frank Scotthern with 34 – 7. San Miguel Alsatians were away to Quesada Diamonds where they shared the points 6 – 6, (91 shots to 90). The Alsatians best winning trio were Jan Farmer, Derek Farmer and Mike Douglas 25 – 11. 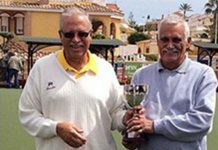 San Miguel Beagles were home to Quesada Pearls, losing 8 – 4 (68 shots to 65), with the best winning trio were Noel Davis, Dave Johnson and Steve Cantley with 14 – 13. 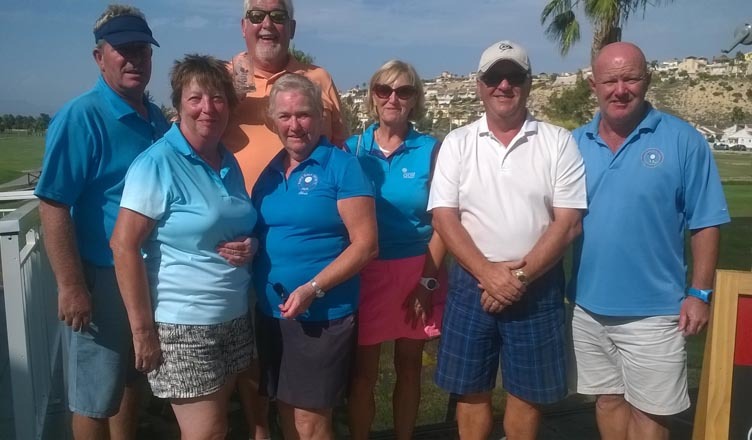 All three teams were playing in the Fed 4’s this week, with the San Miguel Apaches away to Monte Mar Lords, with the Apaches winning 2 – 6 (59 shots to 39) the winning trio were Anita Brown, Mike Douglas and Alan Campbell with 26 – 10. San Miguel Mohawks were home to Quesada Panthers, drawing 6 – 6 (49 shots to 48). The winning rink for the Mohawks were James Cutting, Linda Plaisted, Tony Sansom and Cliff Plaisted with 22 – 14. On Friday San Miguel Boxers were home to Quesada Swans winning 10 – 2 (108 shots to 67). The best winning trio were Stan North, Ann Allen and Dave Champion with 23 – 6. San Miguel Bulldogs were away to La Marina Ospreys drawing 6 – 6 (shots for 68, shots against 95). The winning trio were Tony Sansom, Paul Hayward and Ron Nairey with 17 – 4. SAL Enterprise Division Albatrosses played the San Luis Klingons at home, going down on three rinks, the two winning rinks both finished 17-10! Shots, VB 76(4) – 83(8) SL. The Drivers were also up against it playing the San Luis Trekkers, they unfortunately failed to win any points from this away game. Shots VB 68(0) – 106 (12) SL. Discovery Division Eagles were at home to top of the leader board Greenlands Maples, our Eagles winning on just one rink. Shots, VB 60(2) – 107(10) G.
Voyager Division Buggies were also away at San Luis against the Romulans, they clocked up another great result with five wins. shots, VB 129(12) – 45(0) SL. WINTER LEAGUE…and yet another match versus San Luis! This one was at home on a gusty day, one team forged ahead quickly for a convincing win, two secured the win on the last end, one picked up five shots to draw, the other one lost, a very good home win. Shots, VB 95(9) – 72(3) SL. Vistabella also won the Berleen..nice one! SOUTHERN LEAGUE. Division A Lanzadores faced the Blues at La Siesta winning on four rinks, the scores were up and down but our team finished on top. VB 110(10) – 74(2). The Picadors were away to Greenlands Oaks, wins on two rinks was a fair result against a tough side. VB 72(4) – 101(8) G.
Division C Conquistadors played El Rancho Rangers at home, they almost scored a full house narrowly missing out on one rink. El Rancho paid the price for not fielding a full side. VB 106(10) – 44(2) ER. The Swingers were at home against the Emerald Isle Outlaws, they achieved four winning rinks and lost on one. VB 116(10) – 63(2) .